Set oven for two racks and preheat to 300° F.
Cut a loaf of white bread into 1/2-inch cubes. Spread onto two baking sheets and bake for 15 minutes. Rotate sheets, turn oven off, and leave sheets inside for 15 minutes. When cooled, store dried cubes in an airtight bag until needed. In a large fry pan, heat butter and oil on medium-high and saute onion, celery, poultry seasoning and sage for 4-5 minutes. Pour onion mixture over bread. Add salt, pepper, and TWO cups of stock. Combine well and place in a baking dish (mine is 2 1/2 qt.). Cover with a lid or foil and bake for 30 minutes. Remove cover, drizzle one cup of stock over the stuffing, cover and return to oven for 10 more minutes. If making ahead, refrigerate overnight. To serve, bring to room temperature and reheat in a 325° F oven for about 20 minutes. Before serving, stir in 2-3 Tbsp. of turkey drippings if you can. It adds a lot of flavor. Notes: For more details on this recipe in my blog click here. 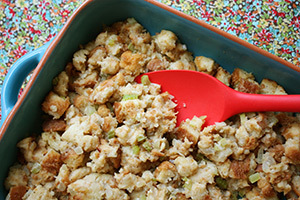 13 Comments on "Simple Bread Stuffing"
I’m going to try your stuffing recipe for a potluck Thanksgiving dinner. I will also add cooked, diced chestnuts. I follow my dad’s idea and I have a feeling it’s going to be really yummy! For those who avoid buying raw chestnuts because of the extra work of peeling them, some Korean markets have a machine that peel them for you after you pay for the chestnuts. It is by far the best dressing you’ll ever eat. Thanks Jenny, love you website. Thank you i will make it soon you are the best. DHi Jenny, I’ve always made cornbread stuffing at my Mom’s and then my sister’s dinner. Do you have a corn bread stuffy recipe? I have never made cornbread stuffing. Thank You Jenny! I have been making so many of your recipies and love all of them, will try this one for Thanksgiving. Wishing you and your family a Happy Thanksgiving. I ment to say a little extra onion and 1 large egg..
love all your recipes. Thanks & have a Happy Turkey Day. Happy Thanksgiving, Jenny. 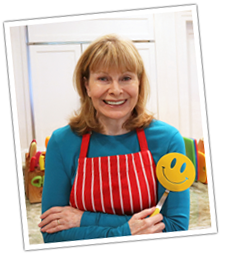 I am happy for all the wonderful recipes you send to me. Have a great Thanksgiving and a wonderful year. Yours looks better than mine, but due to laziness i use vegetable stock so the vegetarians will eat. This year, I WILL make yours and save some with veg broth because you can not beat chicken stock. Thanks as always for a wonderful recipe! I do about the same thing Jenny. but I add giblets cooked and cut up and raisins.Good.